What's behind the name Oro? What happens to our luggage while we’re on the road? What are 'One Night Stops'? Why do you have specific departure dates? Will we meet others enjoying the same holiday at the same time? How challenging is an Oro Tours cycling holiday? Who can enjoy an Oro Tours cycling holiday? What kind of bicycle will we ride? Can we explore at our own pace? What does the price of a holiday include? Oro translates to gold in Italian and Spanish, representing the standard we set and, importantly, it rather resembles a person riding a bicycle! We safely and securely drive your luggage to your next hotel in time for your arrival. While you enjoy cycling or walking each day, our representatives will securely transport your belongings to your next hotel in our minibus. Your luggage will be in your hotel room by mid-afternoon. Your bicycle will have a rack and pannier bag, so you can carry anything you need during the day. At one of our carefully selected hotels, all with en suite bathrooms and all selected for their warm welcome. One of your holiday highlights will be the carefully selected superior quality hotels that you will visit. They’re usually small, family-run and carefully chosen for their comfort, character and warm welcome. All rooms have en suite bathrooms. Our holidays are priced without flights and transfers and you may choose to arrange your own travel if you wish. However, our experts shall be only too pleased to research the most convenient and best value flights for you and, to arrange your airport transfers. Please call for an individual quotation which will be sent to you by email. Holidays booked together with a flight are protected by The Travel Trust Association’s ATOL. Flights and transfers are charged at cost plus a small £20 per person booking fee to cover service and ATOL fees. Customers often like to drive to Germany, Austria, Italy, Croatia or Slovenia and use the safe parking at our base hotels while they enjoy their cycling trip. We’ll give you detailed instructions for getting to your base hotel; at the end of your tour, we’ll arrange transport back to your starting point to pick up your car. If you are driving, we can arrange your Channel crossing too. If you are travelling independently, we’ll give you clear directions for getting to your base hotel by public transport. If you arrive by air from a country other than the UK, you may be able to join our normal airport-to-hotel transfer. If this applies to you, please ask us for more details. All of our destinations offer delicious authentic cuisine. From experience, first-time travellers are pleasantly surprised by the taste, quality and quantity of food available. Whether you eat out or picnic, sampling the diverse local fare in our destination countries is an integral part of your cycling holiday experience. Part of the joy of immersing yourself in the culture of our destination countries is trying authentic local cuisine. As you travel on two wheels, the richness of your holiday experience will be hugely increased by trying local specialities. From decades of experience, first-time visitors to Germany, Austria, Croatia and Slovenia are pleasantly surprised by the quality, quantity and variety of the local food and drink. Italian cuisine is, of course, much more familiar– but for some reason, pizza and pasta always seems to taste particularly good when enjoyed in Verona or Riva del Garda! Don’t worry if you are vegetarian. Surprisingly, even areas renowned for meat dishes cater well for your preferences. In every location, whether you're vegetarian or a confirmed meat-eater, the local equivalent of £15–£25 will buy a mouth-watering meal to satisfy the heartiest appetite. Cycling holidays lend themselves perfectly to al fresco dining. In all our holiday destinations, picnickers will find a wonderful selection of delicious food in even the smallest local shop. The delicious range of culinary possibilities open to you is limitless. Regensburg is widely considered Bavaria’s (maybe even Germany’s) sausage-capital. Austrian strudel, whether the apple variety or the lesser known but equally mouth-watering Weichselstrudel (sour cherry strudel) probably needs little explanation. And did you know that Austria’s crescent-shaped kipferl breakfast pastries actually inspired the now ubiquitous French croissant! Pedal down to the Adriatic and we promise Istria’s delicious char-grilled sardines will delight you as no other ever could. Equally, Croatia’s kremsnita cream slice – with every region claiming that its version is the original and best! Then there’s the similar-but-different Slovenian Kremna Rezina (Slovenian cream cake), a ‘hug on a plate’ that will put an inch on your waistline if you even glance at it! That’s just a taste of the cuisine! Then there are all the new beers, wines, spirits and soft drinks to discover. Our holidays take you from the homes of Slovenian Lasko beer and Italian Valpolicella, to Germanic Europe’s ubiquitous apfelschorle and Croatia’s fiery kruskovac brandy. Cheers! Zivjeli! Na Zdravje! Saluti! Prost! When you book one of our cycling holidays, you get a detailed information pack. It includes an extensive translation section to help you navigate all the delicious menus that you’ll encounter. Most of our tours are available in two formats; two night stays at each hotel, moving on alternate days or, our ‘One Night Stops’ itinerary, where you stay two nights in your first hotel, followed by a single night in each subsequent hotel. All our tours start and finish in different places; we proudly make no compromise when designing our routes, we seek only to achieve the very best cycling experience in each of our regions. While our tours are gentle and leisurely by nature, you will still cover quite a lot of ground over the course of your holiday. By offering specific departure dates, our representative is able to stay nearby throughout your trip, providing you with the excellent service you deserve. Our holidays are independent and self-led, however, by having published departure dates, there are very often a number of parties doing the same tour at the same time. Like-minded people tend to choose our tours and, sharing a drink and swapping stories with your fellow travellers, can prove an enjoyable addition to your experience. We’ve carefully designed, planned and tested all our holidays to make sure anyone who is healthy fit – from infants to senior citizens – can enjoy them. Where appropriate, we even arrange short ‘helping-hand’ lifts to get you up unavoidable longer climbs. This isn’t the Giro d’Italia or Tour de France (although the scenery you ride through will be just as spectacular). 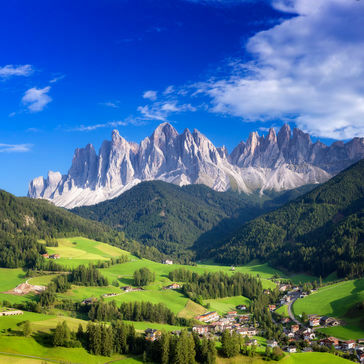 Instead, picture yourself meandering gently at your own pace through breathtaking German, Austrian, Italian, Croatian or Slovenian countryside with time to soak up all the atmosphere and character of these wonderful countries. In Bavaria, for instance, we take you to the mountains instead of over them as you explore the gradually rising landscape between Munich and the Austrian Tyrol. 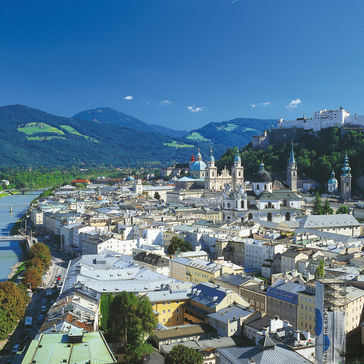 Over the border in Austria, the impressively high majestic mountains are all around you so you can enjoy them – but we guide you between them along spectacular valleys and around tranquil alpine lakes. 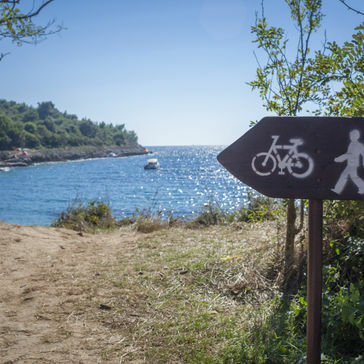 Istria in Croatia is perfect for our kind of cycling, as you head south from Novigrad to Pula, following the unbelievably blue Adriatic coast, on gently undulating cycle paths and quiet lanes. Slovenia is similarly wonderful for our kind of cycling holiday. Imagine a beautifully melded fusion of high mountains and rolling verdant alpine meadows as we start high in the Julian Alps and gravitate downhill to the capital, Ljubljana. It’s the same in the South Tyrol, or as we cycle downhill through the imposing Italian Dolomites to Verona. Best of all, because we plan our tours so carefully, we know exactly where a short ‘helping-hand’ lift makes the difference between a hard day and a pleasantly exhilarating one. The lift up to the Krimml Falls in Austria on our Krimml to Salzburg tour is a case in point. So’s the welcome lift we offer on the ascent from Bled, before you coast downhill to the Bohinj region. Easy: along valleys and beside lakes; very little climbing. Easy+: mostly flat, with perhaps two 10 minute ascents per day. Easy/Moderate: plenty of flat riding, with perhaps three or four 10+ minute ascents per day. Moderate: mixture of flat and hilly cycling, with perhaps three or four 20+ minute ascents per day. Anyone who is healthy fit, from infants to active senior citizens. We have gone to a lot of trouble to make sure our holidays are family-suitable! That’s easy! If you’re healthy, reasonably fit and can ride a bike you’ll love one of our cycling holidays. We’re particularly keen to cater for children – the cycle tourers of tomorrow – so your whole family can enjoy the experience of cycling and exploring wonderful new places together. And, of course, whether they rely solely on human power or choose one of our electric bikes (see below) fit and healthy grandparents can participate in our cycling holidays too! Our fleet of modern, well-maintained bicycles includes special lightweight machines for children over 8 years of age. From experience over more than 30 years, we know that most children from this age upwards will easily wear out their parents! For infants and toddlers under 5 years of age, our top-of-the-range child-seats are probably the safest, most comfortable available. They’ll have a fantastic time. For children between 4 and 10, our fleet includes the very best trailer bikes. These hook onto the back of an adult bicycle, effectively transforming it into a tandem. With this set-up, your child can pedal as hard or as gently as they like, while remaining completely under the control of the leading adult bicycle. What’s more, because we convey all the family’s luggage between hotels by minibus, bringing your children along is a joy – they’ll probably insist on wearing their own junior daypacks too! With electric bicycles becoming so popular, you won’t be surprised to know that these are available for a small supplement. Choose one of these machines and you’ll easily ride up hills, keep going longer and travel further with minimal effort. To make sure your electric bike keeps going all day, we have chosen the highest powered batteries available. Just make sure to charge them overnight at your hotel! After years of experience and exhaustive testing, we’ve elected for the safety, comfort and reliability of the Dawes Sonoran trekking bike for our main fleet. We also have excellent Dawes children’s bikes as well as a limited number of tandems and electric bicycles (available on a ‘first come first served’ basis for a small supplementary charge). View the range of bikes we offer here. Yes, you can. We give you detailed route packs and maps, so it’s easy to follow our very manageable day-stages. And of course, at the end of each day, you know your luggage will be waiting for you along with a warm welcome, delicious food and a comfortable room at that night’s hotel. A couple of weeks before your holiday, we’ll send your travel documents and a comprehensive information pack. On these, we’ll have clearly highlighted our suggested routes for each day of your cycling holiday. As well as the annotated maps, you also get detailed, clearly written instructions. Armed with all this information, you’re now free to enjoy exploring at your own pace every day of your holiday. Because we’ve researched and thoroughly tested every route (often many times) we’ve designed-in plenty of time for you to enjoy total immersion in the landscapes you travel through. This is 'slow travel' at its most enjoyable. It’s probably one of the best ways to really experience an area’s geography, culture, people, history and cuisine. Along the way, explore sleepy villages, picnic by mountain rivers, swim in azure blue lakes and bring those history and geography books you read at school to life. Best of all, you’ll know that at the end of the day a comfortable hotel, warm welcome and delicious meal await you.